Was the 1905 Taft~Katsura Agreement America’s Betrayal of Korea ? It seems impossible to imagine America as being even remotely responsible for the Dokdo problem given the distance and the amount of time that has passed. However as we will see, the Roosevelt Administration’s involvement or lack thereof, helped promote Japanese expansionism on the Korean peninsula. 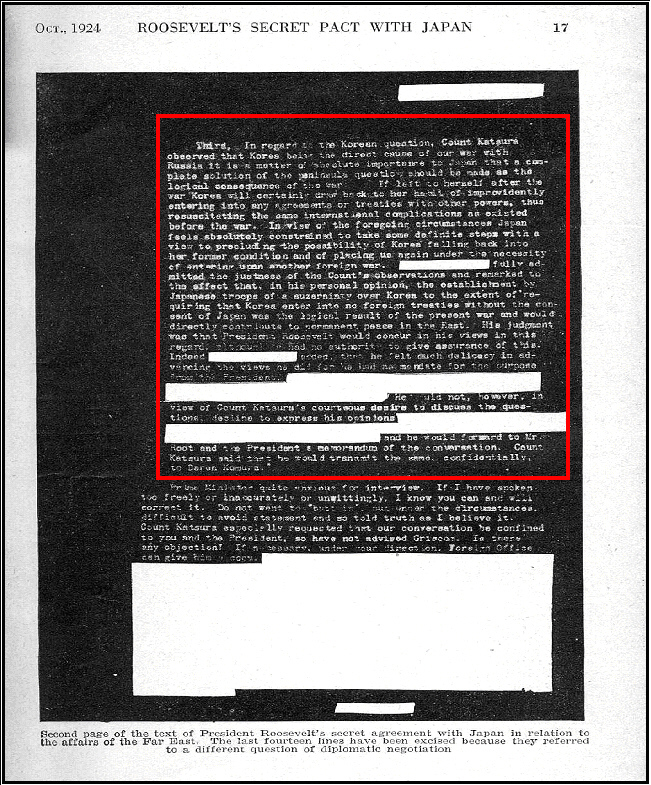 In these secret documents it is revealed how America, in exchange for pursuing her interests in the Philippines, gave Japan unchallenged control over the Korean nation. Above left: Secretary of War William Howard Taft. 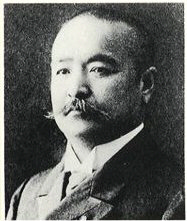 Above right: Japan’s Count Katsura. 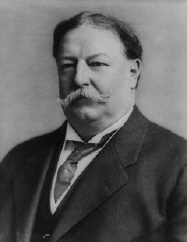 In a secret telegram, William Howard Taft consented to Japan’s colonization over Korea. This agreement was contrary to America’s 1882 Treaty of Peace in which America pledged to “exert her good offices..” and “bring about an amicable agreement..” in the event another government (Japan) dealt oppressively with Korea. President Roosevelt concurred with Taft’s understanding in a telegram on July 31 1905. Territorial agreements struck between colonial powers such as the Taft-Katsura agreement were not uncommon during this era so why is it Koreans feel betrayed by Roosevelt’s deal with the Japanese? Indeed what obligation did America have in 1905 to protect or come to the aid of the ailing Chosun government? When one reads the text of The American-Korean Treaty of Friendship it’s clear that both the Koreans and the Americans have different interpretations of what obligations the Roosevelt administration was subject to. When we read the text of Article I it’s clear the 1882 Treaty of Friendship was not a mutual defence pact. Under this agreement America was in no way obligated to defend Korea from aggression as some Koreans maintain to this day. However, America did fail to honor this agreement on two key points of Article I. A clear violation of Article I was America’s refusal to “exert good offices” (any diplomatic relations) with Korea in 1905 when Chosun official requested aid from the Roosevelt Adminstration after the coerced Japan-Korea Protocol was forcefully enacted. In the fall of 1905 King Kojong of Korea turned to the Americans for support. In October Kojong dispatched Homer J. Hulbert an American missionary teacher in Korea for nearly twenty years, to Washington with a letter asking President Roosevelt for help. When Hulbert met Secretary of State Elihu Root a week after the signing of the coerced Japan~Korea he was told there was nothing the United States could do about it. A cable from King Kojong, sent by Chefoo, claiming that the treaty had been signed under duress had little effect on the State Department which ordered the American legation in Seoul shut down. Additionally the Americans not only failed to “exert their good offices” they refused to honor the 1882 Treaty of Peace by not offering to bring about any amicable agreement to Chosun assertions that the Japan Korea Protectorate Treaty was “signed under duress” as stated by King Kojong. Instead, America washed their hands clean of the “Korea problem” in exchange for a free hand for American interests in the Philippines. The Taft-Katsura agreement was a top-secret document, however it carried the significance of any major international treaty. It has been said to “seal Korea’s death warrant” and was a precursor to the 1905 Japan~Korea Protectorate Treaty. Through this treaty Japan then obtained British consent to colonize Korea under the guise of “protection”. The November 17th 1905 Protectorate treaty was responsible for the dismantling of the Korean Foreign Affairs Office, through which Korea could have officially opposed Japan’s annexing of Dokdo under the Shimane Prefecture Inclusion of 1905. The gradual manner in which Korea was slowly annexed can lead us to the wrong conclusion that this was a willful, peaceful process. 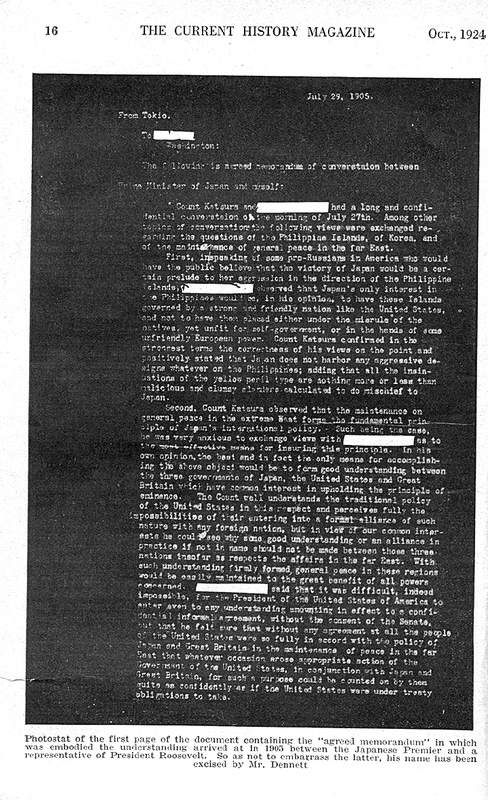 However as the documents show Korea having been abandoned by her allies was left without option but to enter into unfair coerced “treaties” with Japan under duress.